Deb’s Deli in Gardner Street is a kind of microcosm of Brighton. It’s cosmopolitan, it’s suave, it’s ethnic in the way that Brighton has lots of ethnic communities (the North Laine is different to Kemp Town, Norfolk Square, or the seafront, or the Lanes). You walk past it on a dull winter’s day and the door will be open and it will smell of the Mediterranean. To me it is Brighton; it’s not just English because Brighton is not just an English town. It’s too different to be just an English town. It has since closed and re-opened as ‘Hell’s Kitchen’; hmmm…! Does anyone have any history information on why it was named Gardner Street? My great grandfather was Dr. T Gardner – I suppose it would be dreaming too much to think it may have been named after him or the earlier family of Gardners? It may be called Gardner Street simply because it was built on the site of a former market garden. But who knows? As child in the 1950s, Saturday mornings meant half a day helping to lug home shopping from Brighton. We’d start in Upper Gardner Street market, which in those days was nearly all for fruit & veg, and for second hand clothes (forerunner to today’s charity shops?). Then on to Sydney Street to Frank Share the butcher then back to the Boys’ Club for a cuppa, and finally on to what is/was Debs to buy an assortment of unlabelled tins, at cut price, from old Bernie, Debbie’s Dad, who always stood out the front in his brown overall and always, but always, had a fag hanging on his lip. I remember Debbie’s Mum too. My Ma always had a bit of chat with them as, if I remember rightly, they’d come down from the East End, same as her. I also remember that after 25 years of marriage, (a very surprised) Debbie had a – very welcome – daughter, just about when I had my first son. Boy were they jubilant! Buying unlabelled tins gave a few surprises I can tell you. Just occasionally you got home to find that of your dozen tins, eleven were cat food – but no cat! Deb’s speciality was potato ladkes, a Yiddish speciality made from grated potatoes . I don’t think that her best seller, the bacon ladkes, were kosher though! She also did a lovely chopped liver and her smoked salmon bagels were ledgendary. Lemon and black pepper. Oy Aveh. 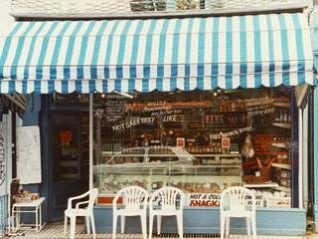 This delicatessen was my great aunt’s (Debbie) but she has sold it to her nephew; my father Michael Rix-Martin. It was renamed Hells Kitchen after a nickname of an American slum were there were Jewish immigrants – NOT after the television program. I have always wondered – are the salt beef sandwiches at Hell’s Kitchen kosher? Debs Delly was my mum’s shop – she took it over from my grandma. The shop has been has been run by family nearly 80 years. When my mum left the country it was taken over by her nephew. My mums latkas were famous all over Brighton especially her bacon ones. I wrote the original heading to this piece way back in 1994 for the original My Brighton… it only appeared on this site in 2006! When we moved to our present house in Hollingbury in 1992 we had no kitchen to speak of, so for our house warming party – 10 days after purchase! – I went to ‘Debs Deli’ and ordered 50 slices of every sausage she had plus loads of Lutkas in every type and lots of varied olives. I remember picking them up from Orange Row at the rear in my old Renault 5. Everything was immaculately presented and covered in foil, the party was a great success and I put it down still to Debs delicious grub!